A marvelous start to the week it was for the Roadrunners, who on Tuesday beat the Ontario Reign by a 5-2 score at Tucson Arena, getting points from 11 different players and scoring a season-high three power play goals. 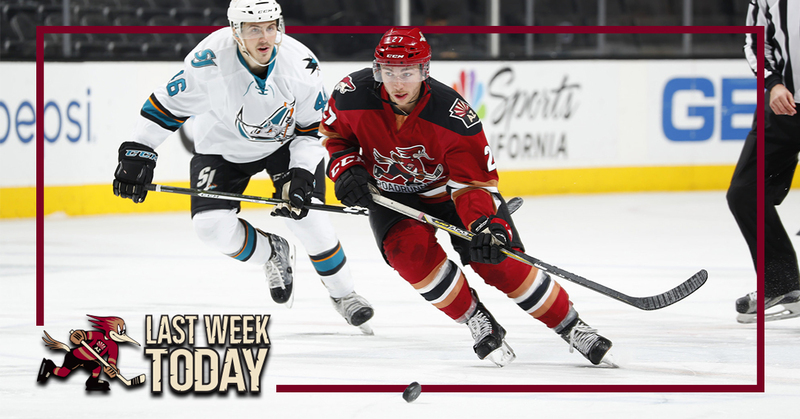 Friday night, in playing the first of a two-game Northern California road trip, the club topped the San Jose Barracuda in a 3-1 victory, scoring a pair of goals in the final minutes of regulation to capitalize on a fantastic 33-save performance by Hunter Miska. Miska improved his record to 7-1-0 on the season. The team’s lone loss during the week came Saturday night at Stockton Arena, where they suffered a 5-2 defeat at the hands of the Heat. Trevor Cheek registered his 100th-career professional point in the loss, netting his first goal of the season late in the third period. Following Saturday’s loss, the Roadrunners were bumped from first place in the Pacific Division for the first time since October. Michael Bunting registered points in all three of the club’s games during the week, totaling four (2G, 2A), and now has points in four straight games. Tyler Gaudet registered points in all three games as well, totaling three (1G, 2A), and also has points in four straight games. Kyle Capobianco made his NHL debut with the Coyotes on Thursday night against the Boston Bruins at TD Garden. He played 13:33 minutes, finished with a -1 rating, and registered three hits and one blocked shot. Michael Bunting receives a pass from Michael Latta in the late stages of Friday night’s game in San Jose, and with time and space, utilizes patience to expose a vulnerable Antoine Bibeau, easily beating the Barracuda’s goaltender to score his sixth goal of the season. “I was in my kindergarten class teaching. Dylan Strome texted me and said ‘Kyle’s in’. We just scrambled as quick as we could, got on the first flight out, and we’re glad to be here.” – Julie Capobianco, on finding out about her son, Kyle, making his NHL debut. "Dylan Strome texted me and said, 'Kyle's in.'" 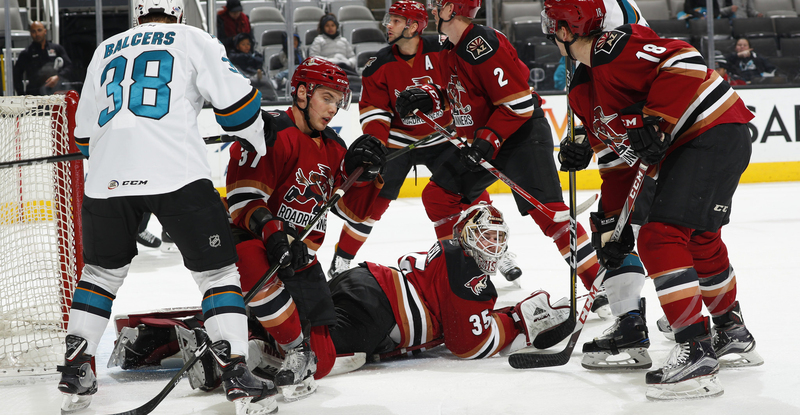 Hunter Miska, down amidst a scrum in front of his net Friday night, makes one of his 33 saves as he is protected by a conglomerate of Roadrunners players. (Credit: San Jose Barracuda).